Action from Posh 2, Southend 0. Photo: Joe Dent/theposh.com. The little chuckle at the end of Peterborough United manager Darren Ferguson’s first sentence in his post-match press conference spoke volumes. Ferguson ended predictable comments about a much-needed win yielding a place in the League One play-offs with a ‘somehow’ and a big grin. Even the newish boss is finding it hard to believe Posh are currently a top-six side after winning three and losing six of their 10 League One fixtures under his command, a set of results in keeping with what was happening for a couple of months before he made his latest return. Marcus Maddison of Peterborough United scores the opening goal direct from a free-kick. Photo: Joe Dent/theposh.com. It will almost certainly be a brief stay among the elite - Posh could be ninth by the time they play again - and it’s still odds on that damaging defeats against some poor sides will prove costly in the long run. 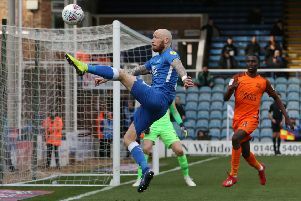 Southend, yesterday’s opponents are hurtling towards League Two, are the worst of the lot on current form and yet a most comfortable 2-0 win at the ABAX Stadium must count as Posh progress. 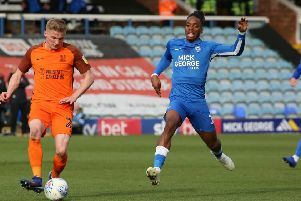 A lot will still have to go right for Posh to take part in the post-season fun, but there were good signs yesterday, most notably in the first-half when glimpses of ‘Fergie football’ were apparent. usually when Lee Tomlin was popping up in space between a midfield passing the ball over shorter distances than was the case under the previus regime, and sole striker Ivan Toney. Getting Tomlin and Marcus Maddison playing effectively in the same starting line-up is a key to future success. Maddison stole the show yesterday by opening the scoring five minutes before the break with a spectacular 35-yard free-kick and by assisting on Ben White’s first goal for the club just before the hour mark, a short-range header after slow-moving Southend ‘keeper Mark Oxley had made a hash of another Maddison set-piece. Statistics prove Maddison’s value as he’s been involved in nine of the last 10 Posh goals to claim his third sponsors’ man-of-the-match award in a row, one accompanied by a fine line from a player who frustrates almost as many fans as he delights. “After five years maybe the fans are starting to warm to me,” Maddison stated. A packed Motorpoint Stand at the ABAX Stadium watch Posh beat Southend 2-0. Photo: Joe Dent/theposh.com. Tomlin also spoke well to the press before this game, crediting Ferguson with rekindling his interest in football. Ferguson now needs to work his magic on Toney who spoilt a battling, committed display yesterday with some wayward finishing. With Ferguson going against his principles and allowing longer balls out of defence Toney’s physical presence is vital if Posh are to keep possession and get their playmakers involved in attacking areas. But he also needs to score goals and he missed two decent chances yesterday which would prove costly against better opponents. That was never likely to be the case against Southend who rarely threatened to disrupt a robust defensive performance as centre-back Ryan Tafazolli made a strong return to action. Ferguson made four changes to his starting line-up with super-sized goalkeeper goalkeeper Aaron Chapman another returnee and he didn’t face a single shot on target. Posh also ditched the wing-backs for a 4-4-1-1 formation. but any line-up might have been good enough against a team whose season has been one long sob story of multiple injuries (14 at the last count) and misfortune. Under-pressure manager Chris Powell fielded two 17 year-olds yesterday, out of necessity rather than choice. If perspective on an easy win and a top six place is required, it was provided by Southend’s sheer awfulness. Posh: Aaron Chapman, Jason Naismith, Ben White, Ryan Tafazolli, Daniel Lafferty, Alex Woodyard, Louis Reed, Joe Ward (sub Siriki Dembele, 73 mins), Lee Tomlin (sub Matt Godden, 73 mins), Marcus Maddison (sub Kyle Dempsey, 85 mins), Ivan Toney. Unused substitutes: Conor O’Malley, Matty Stevens, George Cooper, Tyler Denton. Southend: Mark Oxley, Elvis Bwomono, Rob KIernan, Taylor Moore, Sam Hart. Sam Mantom, Dru Yearwood, Timothee Dieng, Micheal Kightly (sub Isaac Hutchinson, 79 mins), Simon Cox (sub Emile Acquah, 71 mins), Charlie Kelman (sub Harry Bunn, 46 mins). Goals: Posh - Maddison (40 mins), White (59 mins). Cautions: Posh - Toney (foul).